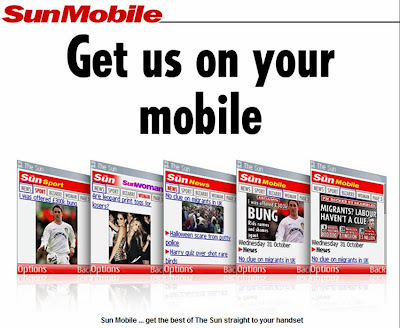 The mobile internet and QR codes - big in Japan and now the Sun newspaper is bringing them to the UK! I was recently invited to a seminar that Nikkei Business Publications recently ran on the Japanese mobile market. They showed various examples of advanced Japanese mobile technology and some of the examples seem to be filtering through to the UK. I have also seen the Sun newspaper pushing QR codes, so thought it was about time I wrote about them! In Japan consumers regularly use mobile phones to access the internet internet access. The most recent figures published by the Japanese Ministry of Internal Affairs and Communications (end of 2005) showed that accessing the internet by mobile phone was more popular than accessing the internet by PC in Japan (70 million vs 66 million people). In the time since I can only assume that this has moved on significantly. The mobile internet in Japan is therefore significantly more advanced than the mobile internet in Europe and there are some interesting examples of how it is used. From a mobile technology perspective, NFC chips have been changing the way devices are used and NFC chips are now commonplace in Japan. We will now start to see NFC chips incorporated in the next phase of UK handsets (allowing phones to be used as Oyster cards etc) and this will similarly change the way UK consumers use mobile devices. From a media perspective, QR codes and Search boxes are the most interesting. QR codes and Search boxes are established features of Japanese advertising. Particularly prevalent in traditional offline ads, these are shown somewhere on the copy and prompt readers to visit websites for more information. Rather than pushing readers to a website, the Search box visible on the ad below prompts a reader to type a certain keyword into a Search Engine and this in turn then serves up a link to the relevant website. This ubiquitous Search tagging is seen in both print and TV ads. Whilst this is interesting and worthy of testing, I just can't see it becoming as popular in the UK. QR codes are effectively advanced bar codes (with an embedded web address) that allow users to access the internet quickly from a mobile device. In Japan, QR codes are used across channels and can be seen on websites, posters, ambient and in magazine ads (as in examples below). QR codes also allow the effectiveness of traditional media like posters to be more accurately assessed as QR code responses can be tracked. The traditional way of using a QR code is to take a photo of it with a mobile phone. This then opens up a browser and points to a site address that is contained in the QR code information. (Need to download a piece of software first.) Newer phones like the N95 have a built in bar code reader and don't need the software download. 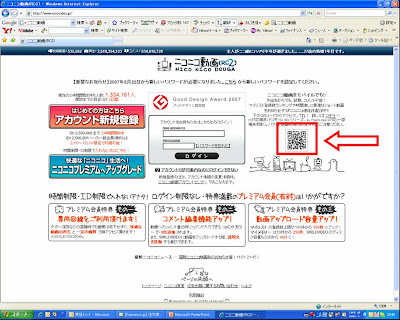 The above QR code example is from a website, the QR code example below is taken from the footer of a JAL magazine ad. Step two: Download free reader ... the i-nigma website will automatically detect your phone’s make and model and download the free reader to your phone - simply follow the on-screen instructions. Step three: Start scanning codes ... launch the i-nigma reader from your phone’s applications. Then centre a QR code in your mobile’s camera viewfinder, snap or just scan the code (depending on your mobile type) and the i-nigma reader will do the rest. I think the mobile internet is finally here and continual developments - from the Sun's initiatives, through to Doubleclick's mobile tracking, through to Google's Android will only serve to increase its momentum. NFC chips and QR codes are offering new opportunities and exciting times lie ahead! I learn something new every time I read your site. Thank you.